Welcome to our home. Keena enjoys resting in front of the fireplace. No shortage of snow when Aiden joined our family. Thankyou Whindancer Kennels. Love company to drop by. Share with us, our love for the Soft Coated Wheaten Terrier. 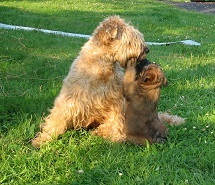 We have had Wheatens since 1987 and have been involved in showing, obedience and agility. 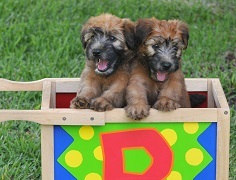 We are an exclusive breeder of Soft Coated Wheaten Terrier puppies. Pinehome is dedicated to the protection and preservation of the purebred Soft-Coated Wheaten Terrier. Pinehome Wheatens have been showing very well in Canada and the United States with multiple Champions produced. See our Champions page for more info on these dogs. Our greatest satisfaction is seeing happy active dogs out with owners who have added a Pinehome Wheaten to their families. They can be found across the country and are involved in obedience, agility, herding etc. See our Activities page to see what Wheatens enjoy. We have a limited breeding program and puppies are sold under non-breeding contracts to approved homes. An energetic medium sized dog, ideal height for males is 18.5 in. at the shoulder and 35-40 pounds. Females are about an inch shorter and five pounds lighter. The Wheaten has a soft wavy coat, that is non-shedding and hypo-allergenic. It requires regular brushing and trims. The Wheaten is eager to learn and makes an excellent family pet. They love to be with people and are very generous with their greetings and kisses. They respond well to a positive consistent training style. 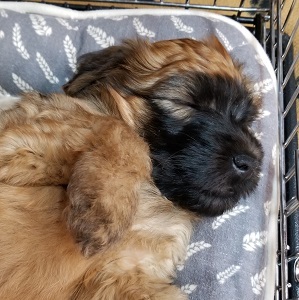 For more information about Soft-Coated Wheaten Terriers and whether the breed is right for your family, please click on the SCWTAC link on the right. Website Note: If you do not see a sliding photo banner at the top of this page, your browser may restrict active sliding windows, press Allow Blocked Content or try another browser.